With foresight and analysis, this incisive article written more than three years ago in January 2013 provides an understanding of unfolding events in Syria. If this cannot be accomplished, however, then crippling Syria to effectively prevent it from providing Iran any form of diplomatic, political, economic, and military support in the face of common threats has been a primary objective. Preventing any continued cooperation between the two republics has been a strategic goal. This includes preventing the Iran-Iraq-Syria energy terminal from being built and ending the military pact between the two partners. Since 2006 and the Israeli defeat in Lebanon in that year there was renewed focus on the strategic alliance between Iran and Syria. Both countries have been very resilient in the face of US designs in their region. Together both have been key players for influencing events in the Middle East, from the Eastern Mediterranean to the Persian Gulf. Their strategic alliance has undoubtedly played an important role in shaping the geo-political landscape in the Middle East. Although critics of Damascus say it has done very little in regard to substantial action against the Israelis, the Syrians have been the partners within this alliance that have carried the greatest weight in regards to facing Israel; it has been through Syria that Hezbollah and the Palestinians have been provided havens, logistics, and their initial strategic depth against Israel. From the beginning the foreign-supported external opposition leaders made their foreign policy clear, which can strongly be argued was a reflection of the interests they served. The anti-government forces and their leaders even declared that they will realign Syria against Iran; in doing so they used sectarian language about returning to their “natural orbit with the Sunni Arabs.” This is a move that is clearly in favour of the US and Israel alike. Breaking the axis between Damascus and Tehran has also been a major goal of Saudi Arabia, Jordan, and the Arab petro-sheikhdoms since the 1980s as part of a design to isolate Iran during the Iraq-Iran War. Moreover, the sectarian language being used is part of a construct; it is not a reflection of reality, but a reflection of Orientalist conjecture and desires that falsely stipulate that Muslims who perceive themselves as being Shia or Sunni are inherently at odds with one another as enemies. Among the prostrating Syrian opposition leaders who would execute the strategic goals of the US has been Burhan Ghalioun, the former president of the Istanbul-based and foreign-sponsored Syrian National Council, who told the Wall Street Journal in 2011 that Damascus would end its strategic alliance with Iran and end its support for Hezbollah and the Palestinians as soon as anti-government forces took over Syria. These foreign-sponsored opposition figures have also served to validate, in one way or another, the broader narratives that claim Sunnis and Shiites hate one another. In synchronization the mainstream media in the countries working for regime change in Damascus, such as the US and France, have consistently advertized that the regime in Syria is an Alawite regime that is allied to Iran, because the Alawites are an offshoot of Shiism. This too is untrue, because Syria and Iran do not share a common ideology; both countries are aligned, because of a common threat and shared political and strategic objectives. Nor is Syria run by an Alawite regime; the government’s composure reflects Syrian society’s ethnic and religious diversity. Syria is all about Iran for Israel. As if Tel Aviv has nothing to do whatsoever with the events inside Syria, Israeli commentators and analysts are now publicly insisting that Israel needs to deal with Iran by intervening inside Syria. Israel’s involvement in Syria, alongside the US and NATO, crystallized in 2012. It was clear that Israel was working in a conglomerate comprised of the US, Britain, France, Turkey, NATO, Saudi Arabia, Qatar, Jordan, Lebanon’s minority March 14 Alliance, and the NATO-supported usurpers that have taken over and wrecked the Libyan Arab Jamahiriya. The Israeli media has even begun to casually report that Israeli citizens, albeit one has been identified as an Israeli Arab (meaning a Palestinian with Israeli citizenship), have entered Syria to fight against the Syrian Army. Normally any Israelis, specifically those that are non-Jewish Arabs, which enter Lebanon or/and Syria are condemned or prosecuted by Israeli authorities and Israeli news reports focus on this aspect of the story. Yet, it has not been so in this case. It should also be mentioned that the Palestinian opponents of Israel living inside Syria are also being targeted, just as the Palestinians living in Iraq were targeted after the US and UK invaded in 2003. Frankel’s line of thinking was not lost on circles in either NATO or Israel. In reality his line of thinking springs forth from the views and plans of these very circles. As a psychological enforcement of their ideas, his text actually found its way to NATO Headquarters in Brussels in 2012 for reading material. While the latter, Israel, released its own intelligence report about the subject. There is also clamouring for steps to be taken to de-link Hezbollah, and by extension Iran, from its Christian allies in Lebanon. The German Marshall Fund showcased a text essentially saying that the Lebanese Christians that are allies to Hezbollah, Syria, and Iran need to be presented with an alternative political narrative to replace the one where they believe that Iran will ultimately run the Middle East as a great power. This too is tied to further eroding Iran’s alliance system. The conflict in Syria is not merely an Israeli affair. The slow bleeding of Syria has other interested parties that want to smash the country and its society into pieces. The US is foremost among these interested parties, followed by the Arab dictators of the petro-sheikhdoms. NATO has also always been covertly involved. NATO has been reorienting itself towards asymmetrical warfare and greater emphasis is now being put on intelligence operations. NATO strategists have increasingly been studying the Kurds, Iraq, Hezbollah, Syria, Iran, and the Palestinians. In the scenario of an all-out war, NATO has been preparing itself for overt military roles in both Syria and Iran. Iraq is being destabilized further too. While Iran’s allies in Damascus have been weighed down, its allies in Baghdad have not. After Syria, the same conglomerate of countries working against Damascus will turn their attention to Iraq. They have already started working to galvanize Iraq further on the basis of its sectarian and political fault lines. Turkey, Qatar, and Saudi Arabia are playing prominent roles in this objective. What is becoming manifest is that the differences between Shiite Muslims and Sunni Muslims that Washington has cultivated since the Anglo-American invasion of Iraq in 2003 are now been augmented by Kurdish sectarianism. It appears that many in the Israeli political establishment now believe that they have succeeded in breaking the Resistance Bloc. Whether they are correct or incorrect is a matter of debate. Syria still stands; the Palestinian Islamic Jihad (which was by far the most active Palestinian group fighting Israel from Gaza in 2012) and other Palestinians will side with Iran even if Hamas will have its hands tied by Egypt; there are still Tehran’s allies in Iraq; and Syria is not the only supply line for Iran to arm its ally Hezbollah. What is also very clear is that the siege against Syria is a front in the covert multi-dimensional war against Iran. This alone should make people reconsider the statements of US officials and their allies about having concerns for the Syrian people merely on the basis of humanitarianism and democracy. Mahdi Darius Nazemroaya, “Obama’s Secret Letter to Tehran: Is the War against Iran On Hold? ‘The Road to Tehran Goes through Damascus,’” Global Research, January 20, 2012. Jubin M. Goodarzi, Syria and Iran: Diplomatic Alliance and Power Politics in the Middle East (London, UK: I.B. Tauris, 2009), pp.217-228. Nour Malas and Jay Solomon, “Syria Would Cut Iran Military Tie, Opposition Head Says,” Wall Street Journal, December 2, 2011. WikiLeaks, “Re: INSIGHT – military intervention in Syria, post withdrawal status of forces,” October 19, 2012: <http://wikileaks.org/gifiles/docs/209688_re-insight-military-intervention-in-syria-post-withdrawal.html>. Lauren Williams, “13 French officers being held in Syria,” The Daily Star, March 5, 2012. Israa Al-Fass, “Mossad, Blackwater, CIA Led Operations in Homs,” trans. Sara Taha Moughnieh, Al-Manar, March 3, 2012. David Ignatius, “Looking for a Syrian endgame,” The Washington Post, July 18, 2012. Dan Williams, “Israel accuses Syria of genocide, urges intervention,” Andrew Heavens ed., Reuters, June 10, 2012. Hassan Shaalan, “Israeli fighting Assad ‘can’t go home,’” Yedioth Ahronoth, January 3, 2013. Rafael D. Frankel, “Keeping Hamas and Hezbollah Out of a War with Iran,” Washington Quarterly, vol. 35, no. 4 (Fall 2012): pp.53-65. 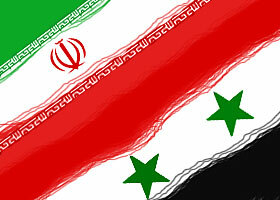 “Weakened Syria unlikely to join Iran in war against Israel: report,” The Daily Star, January 4, 2013. Damien McElroy and Robert Tait, “Syria ‘would not join Iran in war against Israel,’” The Daily Telegraph, January 3, 2013. “Weakened Syria,” The Daily Star, op. cit. “Syria and Hezbollah won’t join the fight if Israel strikes Iran, top-level report predicts,” Times of Israel, January 3, 2013. McElroy and Tait, “Syria would not,” op. cit. Lauren Williams, “New Egypt warms up to Hezbollah: ambassador,” The Daily Star, December 29, 2011. Hassan Mneimneh, “Lebanon ― The Christians of Hezbollah: A Foray into a Disconnected Political Narrative,” The German Marshall Fund of the United States, November 16, 2012. Hilary Leila Krieger, “Israel to join NATO activities amidst Turkey tension,” Jerusalem Post, December 23, 2012; Jonathon Burch and Gulsen Solaker, “Turkey lifts objection to NATO cooperation with Israel,” Mark Heinrich ed., Reuters, December 24, 2012; “Turkey: Israel’s participation in NATO not related to Patriots,” Today’s Zaman, December 28, 2012.